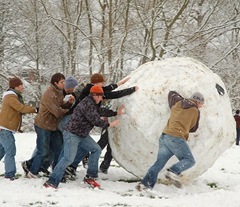 Of Dave Ramsey’s Baby Steps, the one most widely discussed in the blogosphere and elsewhere is #2, The Debt Snowball. This is the step in the program where the participant pays off his non-mortgage debt. Even I can’t find a reason to say this is a bad idea, at least not in principle. If you want to improve your net worth, and you owe lots of money, then paying those debts down is almost certainly the place to start. Many money gurus give advice that makes sense (if it makes sense at all) only in the context of psychology, but few actually admit it. So Ramsey gets points there. But saying the math doesn’t quite work is a euphemism. This isn’t math, it’s money. If you want to pay off your debt as quickly as possible, or if you want to maximize your net worth, which amounts to the same thing, you should pay off the debts with the highest interest rates first. Period. I am hardly the first blogger to point this out. Nickel at Five Cent Nickel posted the near-legendary Dave Ramsey is Bad at Math way back in May of 2005 at the very start of his blog. To date it has 381 comments, the last one dated two weeks ago. Bible Money Matters linked to that post in February of this year and gave the argument in favor of Ramsey. (And for links to no fewer than 12 other blogs that discuss this issue, see this post.) But both Five Cent Nickel and Bible Money Matters, and many others who discuss the Debt Snowball, fall into the trap of calling the issue a question of math. That partially obscures what is at stake. When Ramsey says the math doesn’t work, he means that you’d be financially better off if you successfully followed another scheme. Of course, his argument is that paying off your debts in interest rate order is only better in theory. In fact, you are less likely to complete that plan, whereas his way will generate enthusiasm and momentum as you quickly pay off the first few debts. That may be so for many people, but it seems clear that for many others paying in interest rate rather than size order would be a better choice. There is no obvious allowance for this possibility in the Baby Steps. To illustrate the potential impact of size-first rather than interest-rate-first, consider the following simplified case. A person has only two debts, a student loan for $12,000 at 8% interest with a $100 minimum monthly payment, and a credit card balance of $15,000 at 24% with a $300 payment. Assume the person has $1000 a month to apply to these debts, i.e. $600 beyond the minimum payments. Ramsey would have this person apply $700 a month to the student loan and then, when it is paid off, apply $1000 a month to the credit card. The pro-math camp would have the person pay off the credit card first. The Ramsey way has both loans paid off in 35 months. Interest-rate-first takes 31 months. That’s $4000 in additional payments on what was $27,000 in debt to begin with. Moreover, in this case the encouraging effect of paying off a loan earlier is marginal. Ramsey would have the student loan done in month 18. The other way pays off the credit card in month 19. Of course, these results are specific to this imaginary case and another set of circumstances might give very different results. This is my point. Like much personal finance advice, Ramsey’s is based on a collection of assumptions about his listener/reader. He assumes that they have many different debts. He assumes these debts are in a variety of sizes. He assumes that the interest rates on them are not radically different. He assumes that his listener/reader lacks the willpower to pay off the loans in interest rate order. And he assumes that completely paying off a debt or two early on will generate enough enthusiasm to overcome the willpower problem and that there exists a debt or two small enough to be paid off in this way. Each of these assumptions may be reasonable alone, but assuming all of them at once, and failing to acknowledge them as assumptions, borders on irresponsible. And there are other, lesser problems with Ramsey’s advice on debt, all of it discussed and dissected elsewhere. He has a zealous hatred of credit cards that reminds me of nothing so much as the anti-alcohol campaigners who cannot distinguish between drinkers and alcoholics. He advocates paying down debt rather than taking advantage of your employer’s 401k match, which is, frankly, just loopy. Your employer is willing to pay you to save. Take them up on that. But despite much criticism over the years, the Debt Snowball has become part of the cultural background of the personal finance advice world. It has spawned derivative concepts, such as Snowflaking, the practice of making small savings here and there to apply to debt reduction. The interest-rate-first method has been called the Debt Avalanche. Few, if any, other personalities have had Ramsey’s impact on how paying down debt is discussed. But in those discussions Ramsey himself is a bit of an extremist. Most observers, myself included, concede he has some generally useful ideas but resist the particulars. Even his fans tend not to advocate following his advice too strictly. (See, for example, Frugal Dad’s modified and softened set of steps that might be called Revised Ramsey.) In the Bible Money Matters post mentioned above the author endorses the Debt Snowball before conceding that the Avalanche might be better for some people. This, of course, is as it should be. After all, it’s not merely math. It’s money. Next up in this series will be Baby Step #4, saving 15% of income for retirement. A very interesting discussion. I think that people that are dogmatic about the best way to get out of debt (like Ramsey) are missing the point. People get into debt for lots of different reasons and they will get out of debt in lots of different ways. In many ways being in debt is like being overweight and requires similar tactics to resolve (putting off short-term pleasure for long-term gain). The best diet, like the best debt reduction plan will be determined by characteristics of the person involved. Not true. He assumes that they are more likely to follow through with a plan that rewards them early on. If you told me I had to pay 5% more throughout the process, but I had a 20% more chance to succeed, I would take this in a heartbeat. Assuming that the rules don’t apply to you. That you don’t need any motivation… that you won’t take longer to get out of debt without motivation, seems to be what borders on irresponsibility. No one system can cover every situation. For every guru and every system, we could sit on the sidelines and brainstorm scenarios that don’t fit. I really enjoy the site because it almost always provides for great discussions. I’m sure this thread will have a wide variety of comments. Just wanted to through my two cents in. Dave sees extremist as a compliment. As he says, “be weird”. If you have a big pile of debt as you say, you weren’t being very smart in the first place and any plan is an improvement. I am debt free including the house and must say that it is truly a spiritual experience. I think the reason Dave’s advice is sound is because that the people he’s reaching out to have already had trouble with math. Therefore, a simple math approach won’t work. Look, if I could be persuaded easily by math, I wouldn’t have had the high interest rate credit card to begin with. I think that Dave’s extremist approach helps people open their eyes to the fact that you can be imprisoned by monthly payments. I’ve raised my right hand and vowed never to borrow money again. That’s quite a feeling. It also changes the way I view purchases. It makes me much more frugal and willing to shop around for a good deal. It also prevents me from giving into a want instead of a need. I have to save the money to make big purchases. That makes me think in through real deliberately before jumping in. It also keeps me from using faulty logic to borrow money to buy something I really don’t need. I’ve seen plenty of car purchases (including one of mine) done w/ faulty logic. I enjoyed the article- especially the statement of all of the assumptions of the debt snowball method. I personally would _NOT_ follow a debt snowball because I think how a debt is divided is arbitrary, unless the interest rates or terms of payment are actually different. For me paying there is no difference in paying off a small debt of $X completely vs. paying off $X from any other combination of debts. 1 Make written goals of how much you are going to pay off and when. 2 Track the progress on a chart that you see every day. 3 Make public promises that you will reach your goals- insure that you will be embarrassed if you don’t follow through! 4 Make a reasonable bet that you will follow through on your goal. That insures that someone else is watching your actions and you stand to gain a reward if you follow throw and have some additional loss if you don’t. I’m sure others could come up with more and better means and none of the above will cost you hundreds (or thousands) of dollars in interest, if you succeed! I think these could work even better than the “Victory” of paying off your smallest debt sooner. You’re absolutely right. If I was in the situation you describe, I would pay the larger interest loan first. But It can also be advantageous to do it the other way. For example, I have a car loan and two student loans that I want to repay. The car loan has the lowest interest rate by a considerable margin (1% compared to 3% and 8%), but it also has the lowest balance and the highest monthly payment. Since I will be starting a family soon, it is most important to get rid of the high monthly payment so I will have more room in the budget when the kid(s) start arriving. This has put me in the position of paying down a very low interest loan while keeping high interest loans longer. I know I’m paying more interest in the long run, but I have to live now. With regard to Dave’s advice to skip the 401(k), he stresses this is only during the 12-18 months of the debt snowball. He also stresses that if your circumstances dictate that it will take longer than 12-18 months to get out of debt, you should definitely participate in your employer’s 401(k). I am amazed that you disagree with his no debt period stand yet will quibble over his interest rate vs balance approach. Any purchase will cost far more by financing it. Isn’t there a bit of a disconnect between your two positions? Even for only a year, passing up an employer match is a really expensive way to get yourself enthused about paying off debt. It’s like burning a paycheck or two. I’m not sure how my disagreement with no debt period conflicts with having a strong opinion on how it should be paid off. I think debt is a tool, but a dangerous one that can slice off fingers if you operate it foolishly. I’m all for making decisions based on individual circumstances, but it’s hard to imagine a set of circumstances that would make me want to pay off a 1% loan even a minute early. Wouldn’t you be better off if you took the extra money you were paying on the 1% car loan and saved it? I bet that even in this environment you could do better than 1% on your savings, and chances are interest rates will rise in the coming years. Worst case, you could use the savings to pay off the loan when the kid(s) arrive. That was my thought when I financed the car. However, in our position we’d only open up 200 per month by paying off a student loan (which we couldn’t do for years even if we dumped all our spare cash into it) and $350 per month by paying off the car by the end of the year. This is important as my wife will have to stop working and our income will drop. Besides, student loan interest is tax deductible. I think if you listen to Dave Ramsey, he obviously pushes for his debt snowball plan, over the highest interest first method. But what Ramsey really wants is for people to get out of debt, and I’ve heard him tell people on the radio, on this exact question that “you can’t go wrong getting out of debt”, essentially saying that if they want to do it their way, that’s fine, after all they’re still getting out of debt. He’s just saying that from his experience taking into account the emotional side of the equation, and from counseling thousands of people over the years, that the snowball method tends to work better. My feeling is, whatever gets the job done – you can’t go wrong getting out of debt. Now, this person is getting 8 bills a month, essentially two a week, demanding money and creating stress. They are likely living paycheck to paycheck and to only be getting paid monthly or bi-weekly. Given the number of bills and the timing of their pay it’s easy to envision they forget to pay one of them on time every other month, leading to late fees/increased interest rates and adding to their overall stress. For the sake of argument since I don’t want to run the exact numbers, say they have $1000 available for all the loans, the minimums for all come to $600 a month, leaving $400 towards any one of them. If they paid off the highest interest one first, the $5500 Mastercard, it’ll take about a year. During which time they are still getting 8 bills and 8 stressors each month, likely still incuring juggling act fees for missed payments. However, if they go for the lowest bills, in the same year they would have eliminated 3 bills, and would now only be getting nagged by 5 stressors. Less bills, less pressure, less worry, greater perceived and honestly felt progress (even if it isn’t perfect progress). Because you can see and feel progress (e.g. less bills to worry about), you keep and gain motivation, momentum builds, and you get converted. Additionally, by the time you get to the larger bills, you see real progress because you have a much larger debt snowball to throw at it. The last bill is getting hit with the full $1000 a month, so it feels like you’re taking big chunks of it, and it’s the last bill you have to pay. For me personally, I prefered to use a modified version. I paid off the smaller debts first just to get them the hell off my radar screen, then got analytical on the larger debts to maximize the payoff times. The real difference was a few hundred dollars over a few years versus the best payback method, but for me it was worth peace of mind and focus. Ramsey’s method for getting out of debt was optimized for a specific set of circumstances that he explains very clearly. Ramsey “followers” modify his debt reduction approach so often because they compare their circumstances to his clearly delineated sample situation. That sample situation only realized that they had a DEBT problem because tney had an apparently insurmountable CASH FLOW problem. It was that pain, of hitting bottom because they couldn’t manage the cash flow anymore (or soon wouldn’t be able to), that motivated many of them to change their behavior. As far as debt reduction goes, his plan is better for folks stretched to the limit than the paying the highest interest rate first. The debt snowball is a way to improve their cashflow while instilling in them a strong fear of going back into debt. For the people in his sample situation, that’s a real service. That’s because many people in those circumstances who get a consolidation loan don’t use the savings to pay down the loan, they just borrow more. People in those circumstances need a way out, a plan they can believe in that they can follow, a plan that works. His methods don’t allow rationalization that “this is good debt, so we’ll just buy X.” That’s how those folks got in trouble in the first place, and they need to break those habits. His message resonates with folks in that position because it’s right for them. And, apparently, people follow it closely enough to get out of debt and pretty much stay that way, though I don’t have specifics to prove that. There certainly seem to be quite a few folks using it and happy about it. I favor the debt snowball principle, specifically precisely how Dave Ramsey advocates going through it. If you are talking to the world like Dave, something everybody does not have is certainly enthusiasm. Most people needs to be motivated to keep proceeding, therefore begin with the smallest personal debt and repay it first. Oviously you can tweak Dave Ramsey’s plan based on specifics. The Debt snowball is designed to teach principles. You people have sphincteritis. If people could do math, they wouldn’t go into debt. Try to math your way out of debt and you will easily lose steam and fall back into stupidity. Have fun making your payments! At birth every human being is or ought to be at step 3. Then life happens and we need to get out of the mess to at least get back to step 3. To me there’s not even an issue to argue about with steps 1, 2 and 3. If you have debts and large shovel payoff the debts today. Then decide where you want to go, i.e. adjust DR’s plan to suit your circumstances. I guess what i am trying to say is being at step 3 is common sense, logical and essential, however asap you get there. Hello, Neat post. There’s an issue with your web site in web explorer, might check this? IE nonetheless is the market leader and a large element of people will pass over your wonderful writing because of this problem. as agreed. Get Cash Today No Credit Checks, No Hassles. There are exceptions to all rules. In your example of two debt amounts that are so close in size but the interest on the slightly lesser debt is 3 times as much as the slightly larger debt, Dave would never tell someone to still pay the smaller debt first. I’ve heard him asked similar questions and he definitely doesn’t tell them to follow the guidelines exactly or it won’t work. He does have common sense and he would never tell anyone to pay that much more in interest while paying off a balance that’s nearly the same. Now if someone owed $5000 @ 8% and 20,000 @ 24% he would say to pay the smaller one first because 1) it won’t take very long if they pay every penny they can then when that’s cleared up you have that much more every month to throw at the bigger one. If you actually listened to him it might make more sense to you. There always exceptions. Even with Dave’s baby steps. Sorry, I messed that up. The slightly larger debt had the interest rate 3 times higher than the slightly smaller one. Dave would suggest, in that situation to do what will cost less in the long run which would be pay of the higher interest balance first. You obviously know very little about the man and the advise he gives.